When Shen Tong was still a high school kid in 1985, he was already doing his own business on the campus of Peking University, selling books of poems printed underground. He happened upon a student movement that year which left an impression on him. These two experiences seem to foreshadow his later life: participating social movements and conducting business in the arts market. Shen Tong became a freshman in biology at Peking University in 1986 and quickly became an active student. 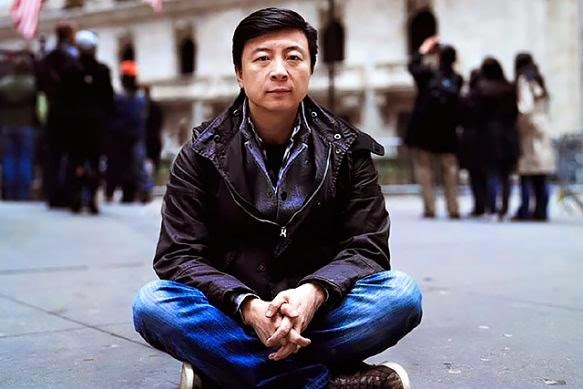 On the New Year's Day on 1987, he witnessed another student protest at Tiananmen Square. Later, he got himself in trouble in a round of campus protest following a student's death and was stripped his position in the official student union. He ended up organizing his own club "Olympia" to study social issues and cooperating with the "Democracy Salon" organized by his fellow student Wang Dan. As the death of Hu Yaobang ignited the 1989 student movement, Shen Tong joined the newly founded Preparatory Committee to lead the movement. But he was never able to find his position there and was always at the bubble of being voted out of it. 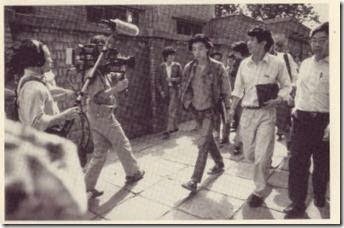 On April 22, when most students were at Tiananmen Square participating Hu Yaobang's funeral, he set up a new broadcasting station at his dorm room overlooking at The Triangle, the center of the campus. This station became the media center at Peking University throughout the entire movement. After the publication of April 26 People's Daily Editorial, Shen Tong was one of the Preparatory Committee members against of a planned protest march. But with the persistence of Wang Dan and others, he joined them at the front of the formation and launched the most glorious demonstration of the entire movement. Later after once again being voted off the Preparatory Committee, Shen Tong took Feng Congde's advice and moved on to form a new Dialogue Delegation and became the co-chairman with Xiang Xiaoji. Under their leadership, the delegation adopted a relatively independent and moderate stance and kept its distance from the movement while seeking and preparing for a dialogue with government. On May 6, they submitted their first petition for dialog and was warmly received. However, they never received a positive response, until after students launched a hunger strike. With hunger strike underway, Shen Tong and his Dialogue Delegation finally had a series of contacts with government officials such as Yan Mingfu which culminated into a formal dialogue. Yet the session failed due to the unyielding stands of the government side and the disruption from the hunger strikers. The Dialogue Delegation dissolved after that and Shen Tong left the movement with deep disappointments. By then he had already received an acceptance letter from the Brandeis University in the US. He applied for and got an approval for visa. When the army shot their way toward Tiananmen Square on the night of massacre of June 3, Shen Tong was at his home near Xidan. He rushed onto the street and witnessed a girl being shot dead standing next to him and a young man being executed by a band of soldiers. By 2000, Shen Tong had finished his school and left the oversea democracy movement. He founded the VFinity company and became a media entrepreneur. His products, including image technologies and TV programs, had reached markets inside China. He made a few low-profile trips to China under government surveillance and with a promise of never involving in political matters. Later he decided to abandon that market. His success in business did not fully wipe out his passion for social movement. In 2011, he plunged into the "Occupy Wall Street" movement in America. At present, Shen Tong is an angle venture capitalist. In late 2014, as a partner in SOSventures, he co-founded the FOOD-X project, aiming to "Feeding a Food Movement." In the evening of January 28, 1989, the magazine New Enlightenment hosted a salon in a small bookstore in Beijing. Many active intellectuals, including Wang Yuanhua, Wang Ruoshui, Li Hongling, Wu Guoguang, Su Shaozhi, Hu Jiwei, Bao Zunxin, Jin Guantao, Yu Haocheng, attended the meeting, along with many foreign reporters. Several intellectuals gave brief speeches on the current affairs. But the highlight of the night was the sudden appearance of Fang Lizhi, who was not even invited. Nonetheless, he was received by a round of warm applause. Fang Lizhi briefed the audience on his recent letter to Deng Xiaoping calling for an amnesty for political prisoners, insisting that the issue of human rights must be raised. Moreover, he proclaimed, "In the past, I have always encouraged people to join the Party and reform it from within. But now I have fully realized that it is not enough. We must also take action from outside of the system. We must force the issue in any way we can." The audience was stunned into silence. The host hastily pronounced that the meeting is over. On January 12, 1989, a few members of the "The Stars Art" group opened an exhibit in Hong Kong, commemorating the 10-year anniversary of their first exhibit. One of them, Wang Keping (王克平), announced that he had finished a new play titled Retrial Wei Jingsheng (重审魏京生), calling for the release of the famous political prisoner. The Stars Art (星星画会) is a group for artists that were formed in 1979 during the Democracy Wall movement in Beijing. They had been frequently in trouble with the government, partly due to their being independent and avant-garde.